Here's another boat photo with a spiritual aura to it . . . I arrived at Keokuk on Friday at sunset before last to attend the Midwest Buffs reception and for about 10 minutes the sun washed the Steamer George M. Verity while those outstanding clouds loomed in the background, only thing missing was the Mormon Tabernacle Choir singing a Heavenly Jubilation. Hallelujah, the Steamboats are Our Salvation! Night time exposure that I took in October 1988 of the GEO. M. VERITY on the evening that the Midwest Riverboat Buffs had their welcoming reception on a Friday night on the eve of an annual weekend gathering at Keokuk, Iowa. Present were Bob and John Miller, Jim Swift of the Waterways Journal and Ralph DuPae of the Murphy Library Steamboat collection at U of Wisconsin, La Crosse. First daytime photo I took of the GEO. 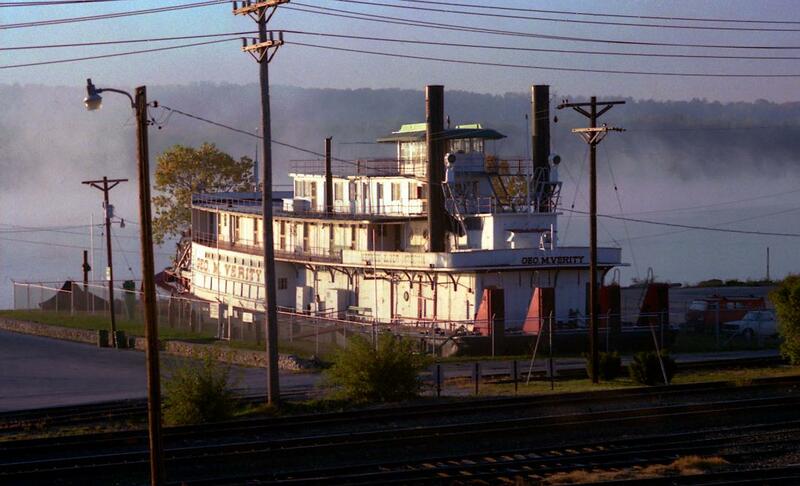 M. VERITY while the mist was rising off the Mississippi River at Keokuk, Iowa in October, 1988. Taken during the early '90's from the roof of the GEO. M. VERITY looking down on her fantail and herringbone style paddlewheel. George M. Verity being pushed into her final berth where she would sit on a foundation and the water drained back into the river. During high flood waters she appears to be floating on the river again when the water rises up all around her. Built in 1927 at Dubuque, Iowa by the U. S. government, as the S.S. Thorpe inaugurated barge service on the upper Mississippi. The first of four steamboats built for the revival of river transportation, it was the first to move barges from St. Louis north to St. Paul. It remained in service there until 1940, when it was sold to Armco Steel Corp. and put in service on the Ohio River. Armco renamed it the George M. Verity after their founder. Now berthed in Victory Park, it houses a museum of Upper Mississippi River history, and is open daily 9:00 AM--5:00 PM, April to November. From several sources listed below I boiled them down into a brief history of the GEO. M. VERITY for you and attached 2 Murphy Library photos of the VERITY when she was active. 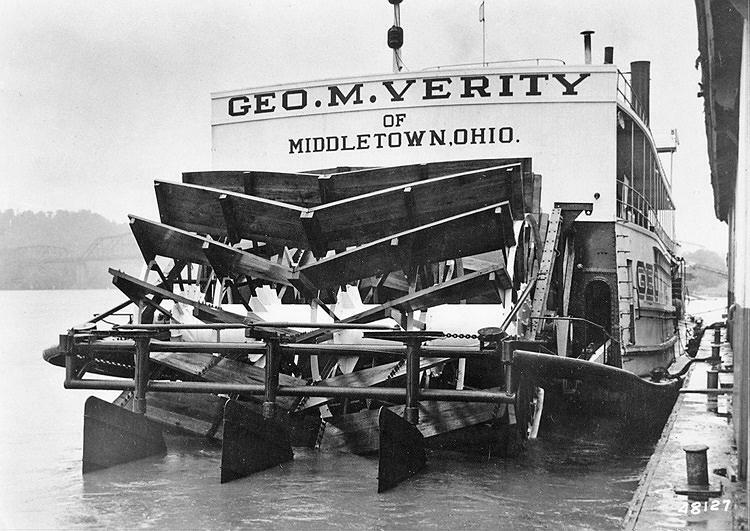 The photo of the stern provides a good view of the "helical"/"herringbone"/"V-shaped" paddlewheel which was designed to reduce the vibrations produced when the old straight "bucket" planks slapped the water and put a strain on the boat. That percussive rhythm is transmitted "shock waves" throughout the boat which first time passengers and overnight guests on a sternwheeler have to get accustomed to. When trying to get to sleep one experiences what feels like somebody is kicking the mattress all night. I haven't found any testimonials from officers or crew of the VERITY which would assure us if the "V" shaped paddlewheel smoothed out the percussiveness that the flat buckets produced. Model makers who tackle the VERITY must find the logistics of engineering a scaled down "V" shaped sternwheel considerably more complex than building a straight bucket paddlewheel. In 1927 a Minneapolis-St. Paul group of investors formed the Upper Mississippi Barge Line Company and had 3 new towboats built including the S.S. THORPE, named after Samuel S. Thorpe, the first president of the Upper Mississippi Barge Line. On August 15, 1927 the THORPE departed from St. Louis with three barges carrying 1600 tons of coal and was under the command of Captain Oscar Olsen and had a crew of 28. For the next thirteen years the THORPE worked for the Federal Barge Line on the Upper Mississippi River. With the advent of more powerful diesel powered towboats the THORPE was sold to the American Rolling Mills Company, better known as Armco Steel, in 1940. 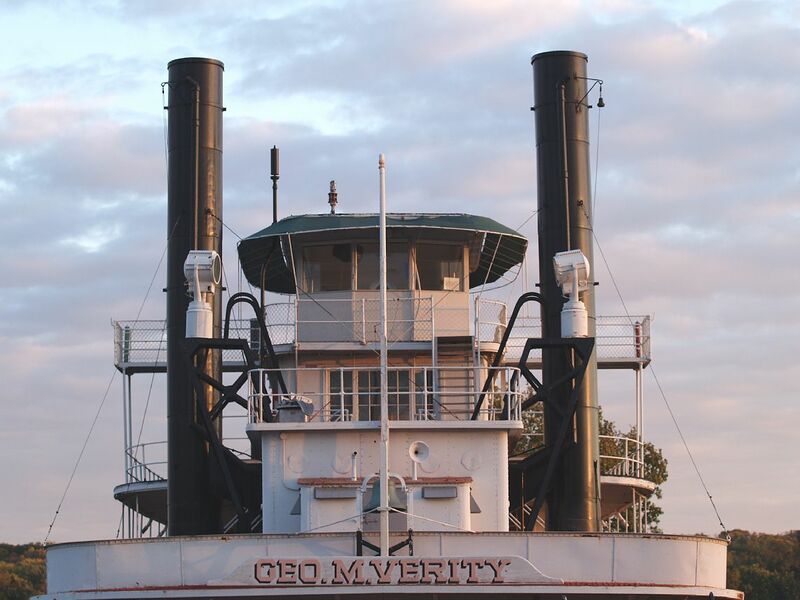 The name of the vessel was changed to the GEORGE M. VERITY, in honor of Armco Steel's founder. Several modifications were made to the vessel before it began its service on the Ohio River. Four staterooms and a lounge were built into the new Texas deck to accommodate company visitors. 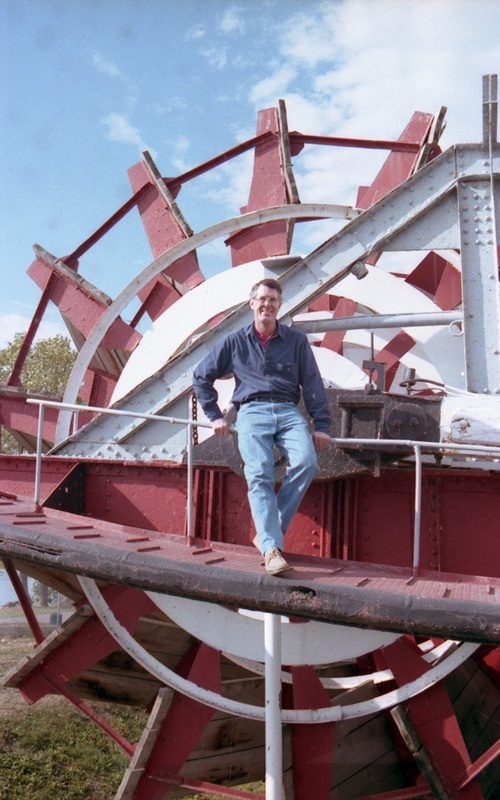 In 1945 a new "helical" herringbone "V-shaped" sternwheel replaced the original conventional paddlewheel which had 16 straight bucket planks that slapped the water with jarring force, producing vibrations which put a strain on the boat's hull and frame. The hull was also widened by adding on fuel tank extensions. By the time the VERITY ended its service in 1960 it had made 1,018 trips between West Virginia and Ohio and delivered 10,108,000 tons of coal. In 1960 the Keokuk River Museum Committee was formed after Harold Heule, an Ohio riverboat captain from Keokuk who notified the Lee County Historical Society that the George M. Verity was to be retired. The 575-ton sternwheeler was beached at Victory Park along the Keokuk riverfront by digging a trench, constructing concrete foundations, floating the George M. Verity into the trench, and finally filling the trench back in. 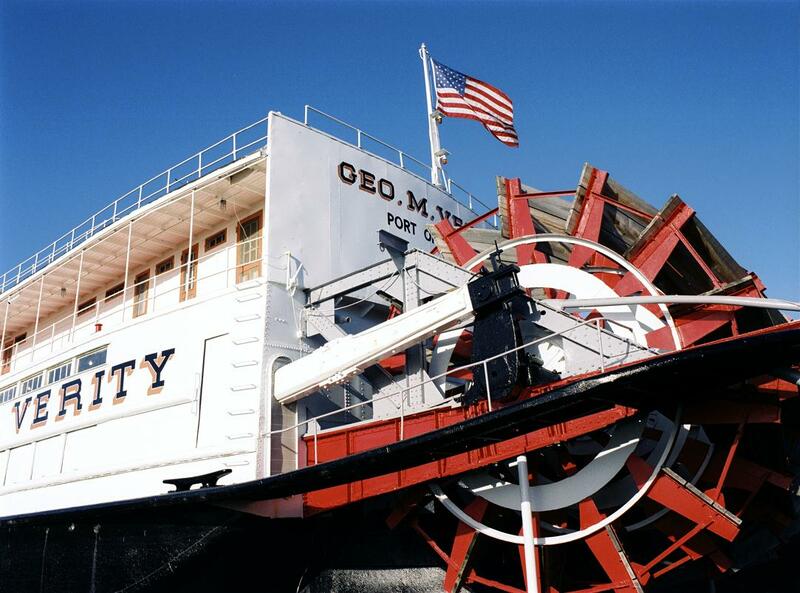 The George M. Verity was dedicated as a river museum on June 2, 1962. In 1990 the National Park Service designated the George M. Verity a National Historic Landmark. 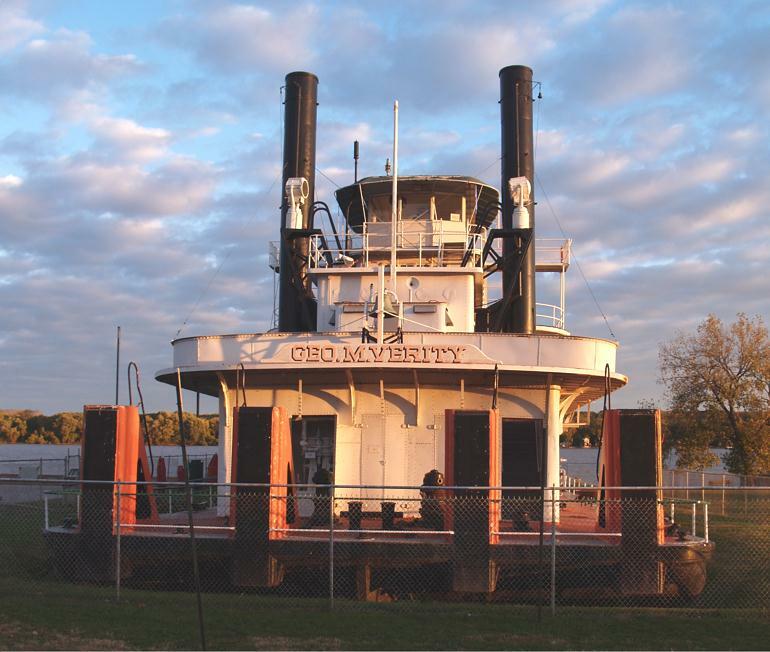 The boat gives visitors an opportunity to see in person an historic towboat with its original boiler, machinery, crew quarters and pilothouse. Verity with a full head-on view with towing knees and even the hull somewhat visible . . . and a portside profile close up of the stacks and pilot house. Here's a photo of myself from the '90's on the fantail of the GEO. M. VERITY at Keokuk.Spent a pleasant morning with curators Bob Miller and his son John that day.Bob has since passed on and John has excelled at photographing towboat and excursion boats like the TWILIGHT. I've scanned most of these current files from original 35mm negatives.The Epson Perfection V500 photo scanner has "Digital ICE Technology" which removes most of the dust and scratches for me but I still have to finesse them to make 'em pretty. This is a photo I took aboard the GEO. M. VERITY in their museum in the main cabin interspersed among the staterooms. Hope that the proprietors there will have this fancy broadside scanned in high resolution because it could then be restored to its original splendor. Had to shoot this at and angle to prevent the flash from reflecting off the glass in the frame.Didn't measure it at the time but the size is probably somewhere between 16 x 20 and 18 x 24 inches. Although most of the text can be read fairly easily the lines "WARSAW CANTON AND QUINCY" AND "TRY US" have faded to the point that they are difficult to read. The towns of Canton and La Grange Missouri are the next fair sized communities north of Hannibal, Missouri. TRY USand treat yourselves to a rest from the dust and noise of the train, to aclean quiet, pleasant trip on the river. GEO. M. VERITY head on view I took around '07 at Keokuk. GEO. M. VERITY lookalike the WEBER W. SEBALD "abandoned wreck still visible"
The towboat WEBER W. SEBALD was one of the GEO. M. VERITY's "sister ships" (The VERITY is now landlocked on display near the Mississippi shore in Keokuk, Iowa). 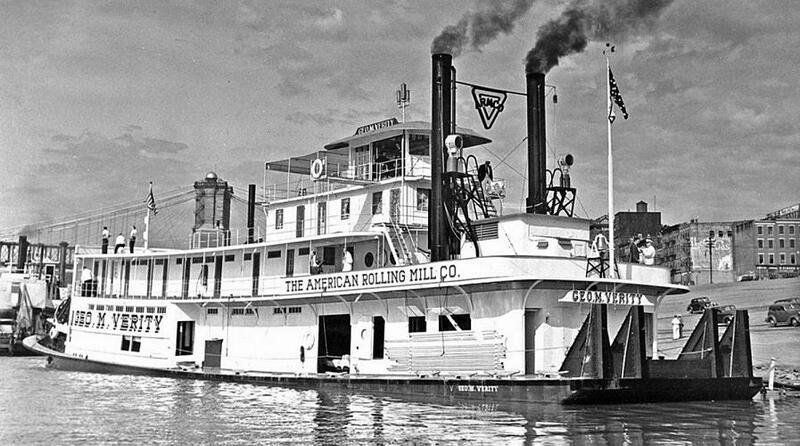 Both towboats included the distinctive herringbone style sternwheel. The wreck of the SEBALD can be seen and visited on the Kanawha River at Charleston, West Virginia. The photo of the SEBALD pushing barge from is from the La Crosse collection. The fascinating color photo of the wreck of the SEBALD is from the Putnam Review 31 August 2015 by Eric Douglas. putnamreview.com The graffiti on the bulkheads of the upper includes some artistic flourishes of fantasy faces and a stylized fish. The towing knees are visible lower left up against an abandoned barge. Description 130 feet long, 35 feet wide. The port side is partially submerged and the interior is mostly gutted. The boat faces east, up river. 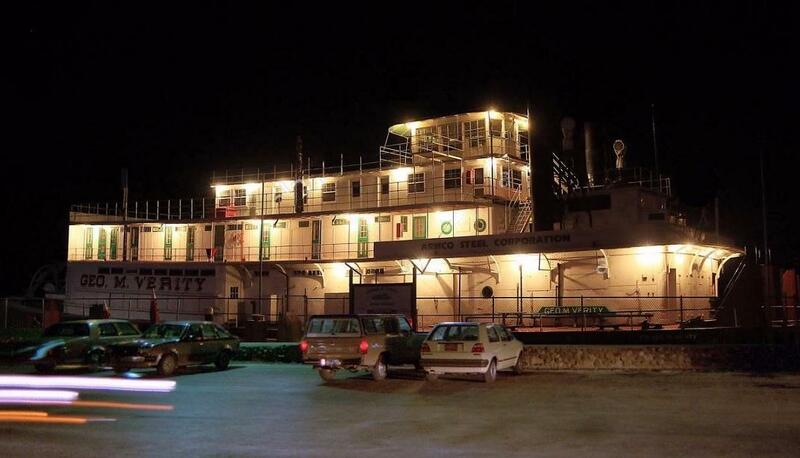 History According to Way's Steam Towboat Directory T2624, the legendary broken-down boat began its life as a steam-powered sternwheeler in 1926, in Dubuque, Iowa. 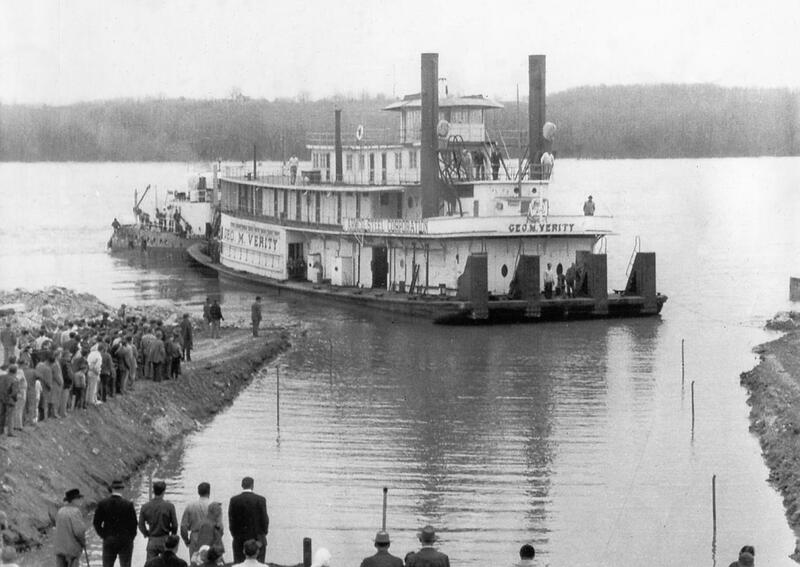 Originally named the JOHN W. WEEKS, the craft was one of three identical towboats built - at a cost of $175,000 each for the newly formed Upper Mississippi Barge Line. A fourth twin towboat, the GENERAL ASHBURN, was built for the Inland Waterways Corp. The 130-foot-long, 35-foot-wide steamboats were commissioned in an effort to jump-start commercial barge traffic on the Upper Mississippi River, which had slowed to a trickle since World War I. The boats made the first St. Louis-Minneapolis through trips taken by tows and barges since 1915, and in their first 10 years of operation, were instrumental in quadrupling the tonnage of freight shipped on the Upper Mississippi. During the winter of 1929-30, the WEEKS and her sister towboats were modified to work with larger tows. Their pilothouses were raised a deck, and the old pilothouses extended back to serve as radio rooms. Bridge wings were added, and their searchlights were raised 7.5 feet. 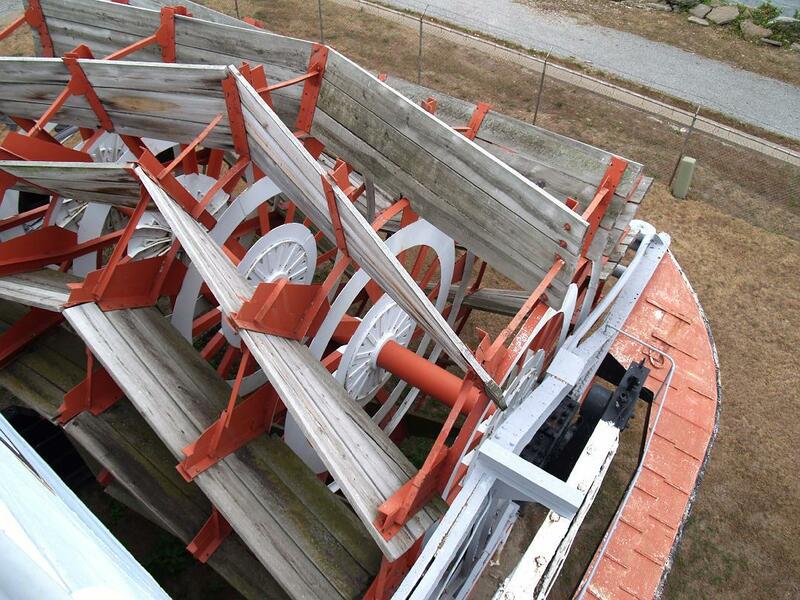 Sometime in the 1940s, the boat's conventional paddlewheel was replaced with a new "herringbone" paddlewheel of a V-shaped design, which was supposed to reduce vibration when the wheel's "buckets" struck the water. 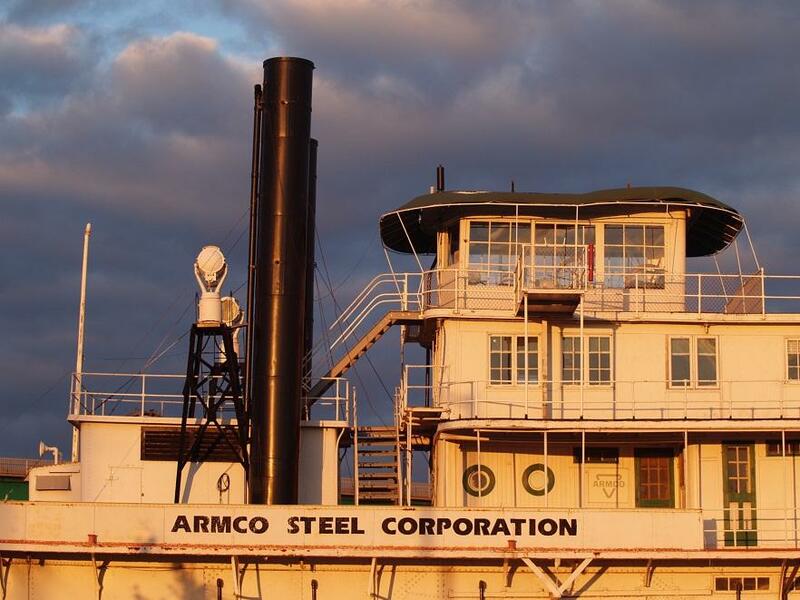 In 1948, the three sister towboats were sold to American Rolling Mill Co., later known as Armco Steel, and spent much of their working lives hauling coal from the steel maker's terminal in Huntington to the company's plant near Cincinnati. The towboats also powered coal barges down the Kanawha from as far upstream as Harewood, Fayette County. The JOHN W. WEEKS, named after one of the Upper Mississippi Barge Lines officers, was re-christened the WEBER W. SEBALD in honor of a former Armco president. "The SEBALD was impressive - a real beauty," wrote R. Dale Flick, a Cincinnati resident and treasurer of the Sons & Daughters of Pioneer Rivermen, in an e-mail interview. "I recall her well as a kid living in the area known as Coal Haven in Cincinnati's East End near present-day Lunken Airport. ... Boy, could the Sebald 'roll a wheel' steaming up past Coal Haven here on a high river. She was immaculate, pristine and always freshly painted. The glass in her pilothouse shone like the Hall of Mirrors at Versailles Palace - a little exaggeration there on my part." The SEBALD and her sister vessel from Dubuque, the GEORGE M. VERITY, also a part of the Armco fleet, were seen almost daily by Flick and other Cincinnati-area riverboat admirers in the 1950s. The SEBALD "had an unusual 'wild cat' whistle that when blown would really screech," according to Flick. "Wild cat whistles were smaller whistles mounted on the top of the whistle bells. If there was an emergency, the pilots would pull down on the whistle cord for the usual blast - WHAAAAAOH - and then down some more to make the loud WHEEEAH! When radar and new boat-to-boat radios came along, the whistles were used less and less." In 1956, the WEBER W. SEBALD got more than its 15-minute quota of fame when two episodes of NBC's "Today" show were produced on and around the towboat. Host Dave Garroway started the first day's program from the deck of the SEBALD, as it chugged along the Ohio River near Armco's First Street dock. 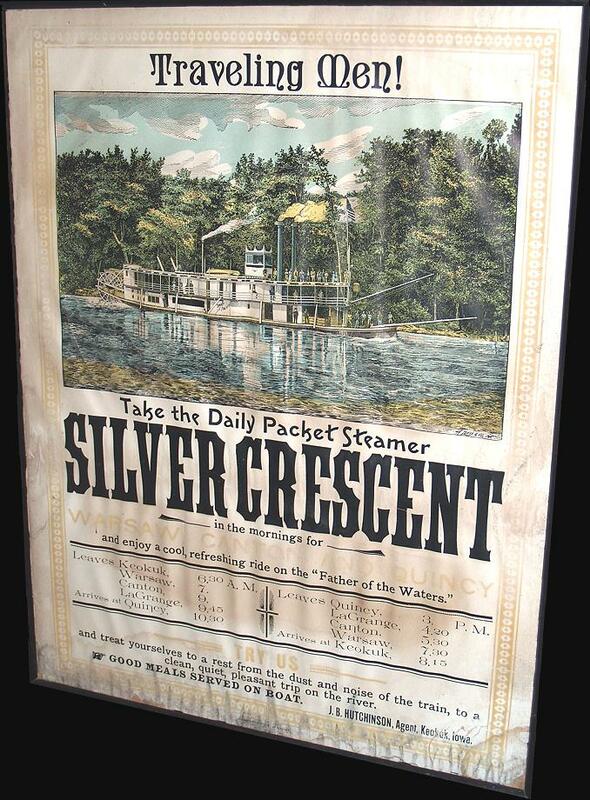 That program featured a race between the SEBALD and another steam-powered paddlewheel towboat, the J.T. HATFIELD, owned by Amherst Barge Co., precursor of the Port Amherst-based Madison Coal & Supply. The race was run between Proctorville, Ohio, and the Huntington-Chesapeake Bridge. That the SEBALD and the HATFIELD were look-alikes was no coincidence. The J.T. HATFIELD began its life as the GENERAL ASHFORD, one of the SEBALD'S three sisters built in Dubuque. "It was a long race, but the HATFIELD," said Charles T. Jones, president of Port Amherst Ltd. Both boats were pushing an equal number of empty barges during the race, and the barge tows eventually meshed together, making it impossible for either vessel to surge to a commanding lead. "One boat would pull ahead a few yards, then the other would catch up and pull ahead," Jones recalled. The next day's segment, much of it filmed from the deck of the SEBALD, focused on the railroad industry, using Armco's rail-barge transfer yard along the Ohio River as a backdrop. Accompanying Garroway on the Huntington swing was J. Fred Muggs, a chimpanzee and a regular on the show. An estimated 15 million viewers saw Garroway and his entourage on the SEBALD during his Huntington visit. In 1960, Armco discontinued river operations in favor of railroads and more powerful boats capable of pushing much larger tows. 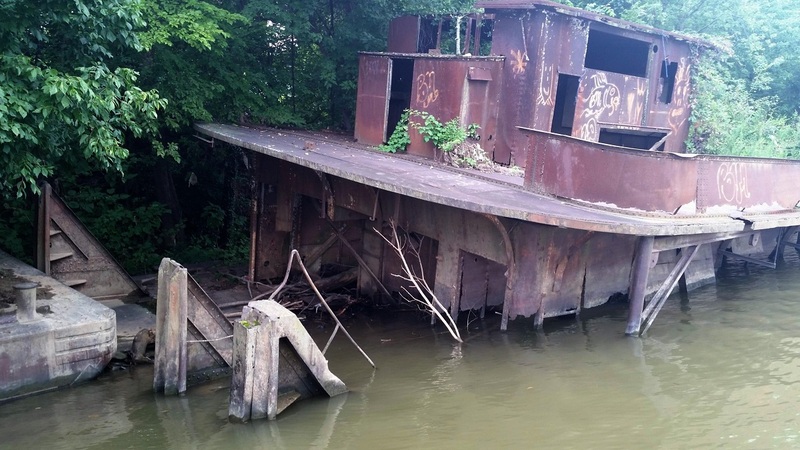 The SEBALD's engines and boilers were removed and scrapped and she was given to the city of Ashland, Ky., to use in conjunction with a public marina. "It was the clubhouse boat," said Bill Barr, marine traffic manager for Madison Coal and Supply, and a board member of Sons and Daughters of Pioneer Rivermen. "It had an office for the marina and housed other marina functions." The SEBALD's sister, the VERITY, was given to a citizens' group in Keokuk, Iowa, who made it the centerpiece of the Keokuk River Museum, which tells the story of navigation on the Upper Mississippi River. 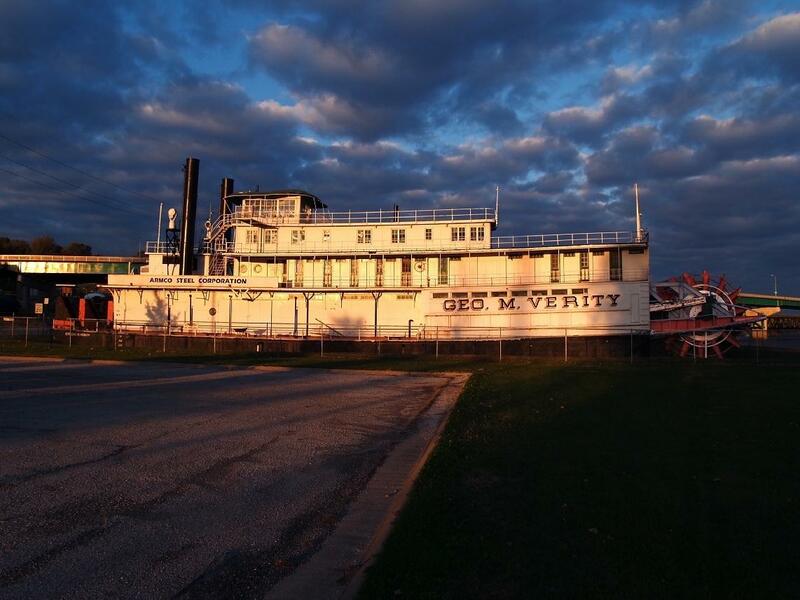 The National Park Service designated the Verity a National Historic Landmark, and the boat was given a permanent berth on a low bluff on the edge of the Mississippi. But twists of fate left the SEBALD far from high and dry. In 1969, city officials in Ashland determined that the boat had seriously deteriorated, and stopped using her as a marina headquarters. The SEBALD's two-toned whistle and one of her pilothouse name boards were donated to the Ohio River Museum in Marietta, Ohio. The vessel's bell was mounted in front of Ashland City Hall. The SEBALD was towed to Mountain State Construction Co.'s river siding behind the Value City store. There, on the night of Nov. 2, 1970, she sank. "Broken-down boat, Dad, broken-down boat!" I would look in the rearview mirror and see two tiny right hands jabbing index fingers in the direction of the boat ramp. More often than not, I would make the turn down to the boat ramp, drive to the Kanawha River's edge, and park in a way that gave the boys an unfettered view across the river of the rusting hulk of a sternwheeler sprawled on a bank at the rear of the Value City parking lot. Then I would make up another legend about how the steam-powered riverboat came to its final resting place in The Badlands. One of my versions had the boat's captain deliberately running the craft ashore to save his passengers and crew when he realized its boiler was about to explode, or when its cargo of cotton - don't ask - caught fire. Another had the boat being bombarded and disabled by either Union or Confederate artillery, and forced to make a crash landing on the Value City shore. While the boys responded enthusiastically to any and all accounts I fabricated to explain the presence of the derelict steamboat hulk, I always wondered what the boat's real story might have been. It turns out the nonfiction version is at least as colorful as the story lines I invented. The once-proud SEBALD now lies sprawled against a muddy bank of the Kanawha River, with nearly full-grown sycamores and willows pressing against the sides of its upper deck and rising above the remnants of its pilothouse. A freshly made bird's nest is perched on a corner of a glassless window. The SEBALD's engine compartments and most of her deck lay underwater, while a portion of her bow, where Dave Garroway once entertained and informed a live national television audience, rusts in peace at water's edge.